We have five 3 bedroom cottages all situated on beautiful Lake Muskoka. 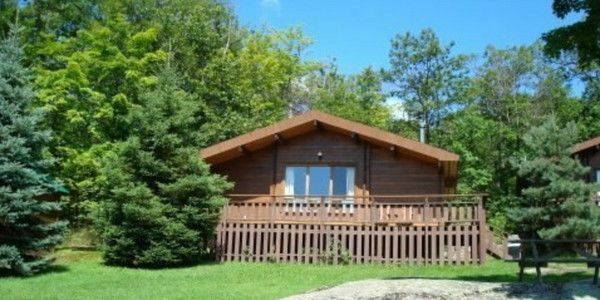 Each cottage has a wood burning fire place, colour TV and large windows overlooking the beautiful property and lake. Kitchens come fully equipped with many extras including a coffee maker, microwave, BBQ and picnic table to enjoy dining both in and outdoors. Each cottage has access to wireless internet, and Bell Satellite TV, free of charge. The 3 bedroom cottages are four-season log chalets with cathedral ceilings. Guests must bring their own linens, towels and or cleaning supplies - please inquire for more details on what we offer. Superior self-catering cottage resort right on lake Muskoka. We rent for 7 nights for July and August. Rates based on 6 person occupancy. The off-season months we cater to re-unions and are willing to rent the whole Resort to guests for all need. We rent for 7 nights for July and August. Rates based on 6 person occupancy. The off-season months we cater to re-unions and are willing to rent the whole Resort to guests for all need. Extra person fee of 100 per person per night after the first 6 guests.